BOA Compression SI Belt – Pacific Medical, Inc. Provides support for the Sacro-iliac joint. Excellent adjunct to post-injection pain following an S.I. procedure. 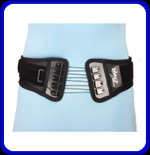 Reduces pain and swelling for strained or lax Sacro-iliac ligaments.